ON-LINE BOOKING WILL RESUME SOON! PLEASE CALL OR EMAIL FOR PICK-UP RENTALS. Spring Nuu-Muus have arrived! Stop in this week for best selection! Incredible Closeout Savings on the BIC SUP 9'2"
The BIC SUP ACE-TEC 9'2" is a great, all around, fun board for the lighter paddler on flatwater. But it really shines in knee to head high surf. 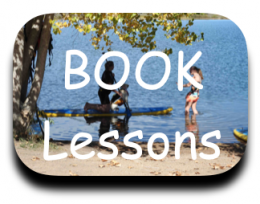 It is the perfect board to learn how to SUP surf. It's Spring time in the Rockies! You know that means the weather can fluctuate between sunny and 70 to blowing snow in a few minutes. 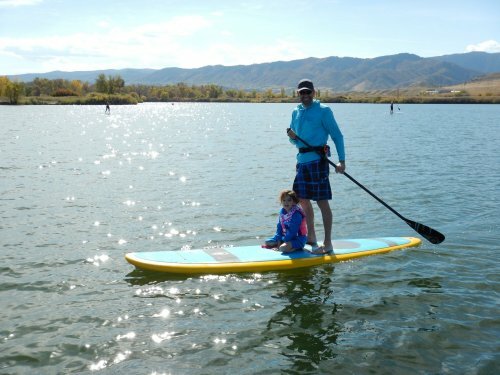 The good news is that Soda Lake at Bear Creek Lake Park, Aurora Reservoir, and Chatfield Reservoir are all open for Stand Up Paddleboarding. Most of the other Front Range Lakes are open or will be open soon. The water is still very cold so we encourage you to paddle with a buddy and have all necessary safety gear and clothing. If you are unsure about what gear you need to paddle safely in cold water stop by the SUP Shop and we'll help you sort out your options. If you want ideas about dry land or on water training this Spring to get pumped up for prime time SUP TIME stop by the SUP Shop. We'll show you how an Indo Board and a TRX Rip Trainer can be used to pump up your Stand Up Paddleboarding. The Surf'SUP Colorado SUP Shop is AMAZING!!! So what do you call a SUP Shop that has 60+ different models of Stand Up Paddleboards on display in our "Board Room?" Some call us crazy, but we prefer to think of it as absolutely amazing. Add to that the great selection of water worthy athletic wear that Lori has brought in from Body Glove, Nuu-Muu, Bold Babe, and others and you have one stop shopping for yourself and your paddle crazy family and friends. Shop for a gift or a necessity for your next trip or the next SUP season. Now is the time to shop for that new SUP that you've wanted. Whether you are shopping for gear for a getaway to some place warm, sunny, sandy, with palm trees and perfect waves to surf, or our great Colorado lakes and rivers, we have you covered. Come check out Colorado's best selection of SUP boards and gear, water worthy athletic wear, and accessories. Don't forget your slippas (flip flops). Gift certificates are the perfect gift idea when you really can't decide which new SUP board to give your special someone. 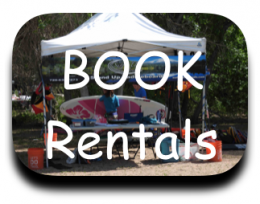 We offer custom gift certificates that can be used for lessons, rentals, and everything else you can find in the Surf'SUP Colorado SUP Shop. Aloha! Welcome to Surf'SUP Colorado! 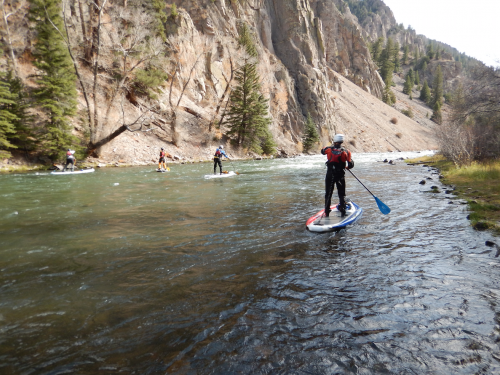 Colorado is a great place for Stand Up Paddleboarding. And Surf'SUP Colorado is a great place to go for all your SUP needs. 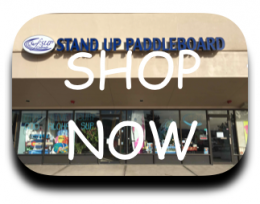 Our SUP Shop is a full service, specialty Stand Up Paddleboard shop with over 50+ models of SUP boards on display, featuring BIC, GLIDE, Imagine Paddle Surf, Creed SUP, and Earth SUP along with a great selection of paddles, MTI pfd's, and a full range of accessories. We also offer the best selection of SPF 50 and SUP-specific apparel in the Denver, CO, area, with brands such as Bold Babe, Body Glove, Breathe, Nuu-Muu, Sweet Waterwear, SUPreme, Victory KoreDry and NRS. Pick-up rentals are available at our conveniently located SUP Shop in Quincy Plaza at C-470 and W. Quincy Ave. Our pick-up rental quiver includes hard boards and iSUPs for flatwater, yoga/fitness, touring, and river SUP. Surf'SUP Colorado holds permits to operate at Aurora Reservoir and Chatfield State Park. 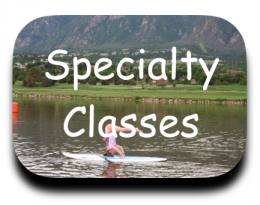 Our professional ACA certified instructors offer SUP instruction no matter what level of SUP coaching is needed. Our Intro to SUP group classes have introduced over 1,000 paddlers to the world of Stand Up Paddleboarding. We also offer one on one training sessions to maximize your SUP skills whether you are headed to the Upper Colorado or Hanalei Bay in Kauai. 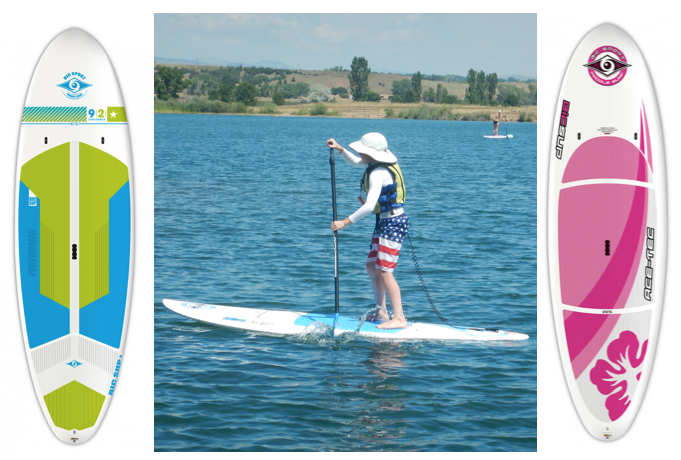 Our convenient lakeside locations also offer the best SUP quiver in the Denver area with over 10 different models of SUPs available, from 8' boards for the kids all the way to 12'6" touring boards. We can also arrange a demo session for most of the boards we carry in our SUP Shop. Our friendly, knowledgeable staff members are passionate about Stand Up Paddleboarding and are uniquely qualified to help our customers realize their SUP goals, whether it be for flatwater, fitness, racing, river, or surf. Contact us today to start YOUR Stand Up Paddleboarding adventure! For more info click: SUP Shop, Instruction, Rentals. To read more about the Surf'SUP "Story." 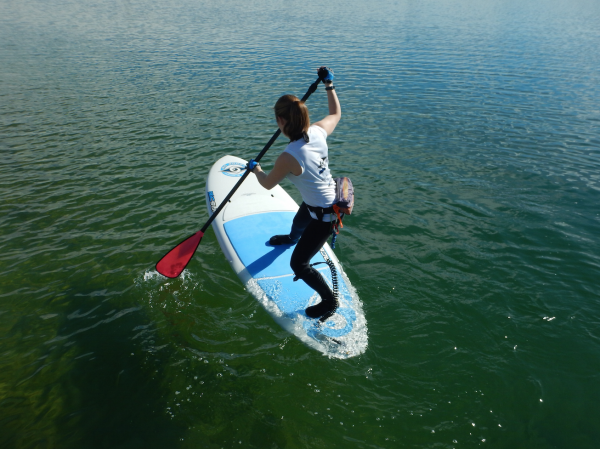 Brittany test paddles the new Bic 9'2"